Los Angeles, Sierra Nevadas , Death Valley, Las Vegas & Back! This is a story of a recent road trip I had the honor of taking with my good friends Frank and Wolfgang. We traveled in a truly incredible road machine, the Phoenix II, formerly known as the Phoenix One. We found our theme for the trip on the wall of a falling-down cabin in Bodie, CA: "Nothing Endures but Change. 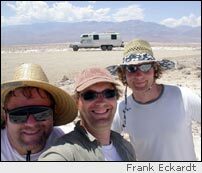 "Frank Eckardt is a geomorphologist, from Capetown, South Africa. Wolfgang Buermann is a climatologist from UCLA, and I am a remote sensing physicist. Our minds have been stretched by our disciplines to encompass nature's tremendous range of change, both in time and space. On this trip, the evidence for change was "in-your-face" overwhelming. We are indeed a young race inhabiting an ancient planet. If you decide to do this loop, be sure to bring along maps, references, and resources like Geology Underfoot in Southern California , by Sharp and Glazner. We left the Los Angeles Basin via Interstate 5 heading north before dawn on a Saturday morning. We passed by Vista del Lago. Ordinarily, the Visitors Center is a great place to catch your breath from the road. It's free, quiet, and cool inside, and it has interesting displays about California's water system, one of the greatest public works on the planet. It also has clean bathrooms. Unfortunately, landslides last winter closed the road, and it is unclear when the repairs will be finished. We continued north on Interstate 5 to the confluence of the Garlock and San Andreas earthquake faults. The satellite photos we were carrying illustrated that this is a dramatic collision of a young and active tectonic lateral fault and a large regional fault that is nearly perpendicular. The body of water to the east of Lebec is a sag pond. When lateral faults move, gaps open up and the ground sags into a depression. This is a very active and complex region, but this area is slated for a huge development. Two major aqueducts pass through this area as well as the major highway. In fact, Interstate 5 follows the San Andreas for a piece before winding down the Grapevine grade. More geologic info is online here. There is a Starbuck's Coffee store at the Grapevine exit. For roadtrips involving a lot of driving and not much time to wander around looking for things (a cool adventure in itself sometimes), it's useful to do an Internet search for favorite business locations before your trip. The Next Exit guidebook lists businesses at all major Interstate exits, or you can use the free program provided by TravMatix for figuring out, while on Interstates, where and when to stop for lunch, gas, etc. The RTA Fuel Cost Calculator also provides current fuel price information for most major towns in the USA and Canada.